Vilkku's parents are FI CH SE CH Neatut Kadluk KVK1 REK1 "Jyry" ja FI CH NordJW-09 Cahppes Miss Qrendi KVK1 REK1 "Yona". 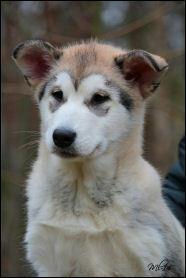 Vilkku was our pick puppy mostly because she is so alike her mom, Yona - both looks but also temperament. Vilkku is very energetic and sassy little girl, but also happy and she loves everybody, just like her mom. We got what we hoped, nice, speedy addition to our team. She can go co-lead and every other place in our team. 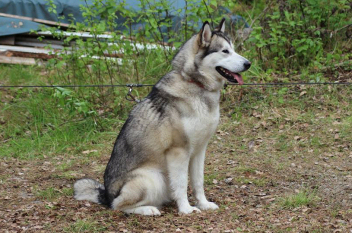 Vilkku has already been at Puppy Show at Kouvola 8.3.2015 and she was there BOS-puppy and her brother Lassi was BOB-puppy. Vilkku's first official working result came from Ruunaa Race 2016 in MD4-class. Distance was 3 x 32,5 km = 97,5 km and result was REK3. Vilkku has also ran Eastpoint Open 100 km (diminished in 75 km because trail condition) race in 6-dog class in Feb 2016. 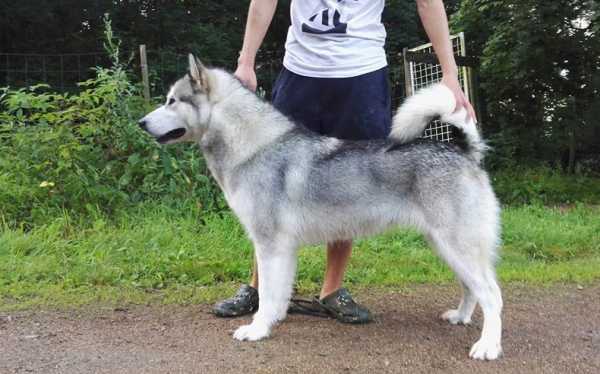 In 2017 Vilkku got her first KVK1-result from Alaskan Malamutes official weight pull test. Vilkku has also attended to FWPA's weight pull competition in season 2017 with good results.